1986-1997 Ford F-250/350's 4x4 Solid axke Dana 60 with larger tires, lift kits, and for those just looking to tighten up the steering will appreciate the quality and performance of our dual steering stabilizer kit. This kit is entirely bolt on and requires no drilling or grinding*. The center bracket mounts to the diff cover as well as clamping around the axle. This added to the heavy duty gusseted construction makes for a solid mount for the stabilizers. We have also designed this so that both the inner and outer stabilizer mounts are in dual sheer to prevent twisting and to further strengthen the kit. Moral of the story, we went all out to make a solid, well thought out kit. Kit includes everything needed to install on a traditional steering setup. If you have any questions, please dont hesitate to get in touch with us! THIS WILL ONLY WORK ON DANA 60 SOLID AXLES!! WILL NOT WORK ON TTB (TWIN TRACTION BEAM) AXLES!! MODIFICATIONS ARE LIKELY FOR TRUCKS RUNNING SWAY BAR SYSTEMS!! By customer request we have now begun offering this kit with either Bilstein 5100, Fox or King shock upgrade options! Bilstein 5100: These stabilizers offer a high quality, affordable shock. Steel body with zinc plated finish. Featuring a gas over hydraulic design to prevent fade in any environment. Comes with removable black boots. Fox 2.0 IFP: 2.0" Metal impacted 6061-T6 aluminum body construction for long term protection from rust. Internal IFP mono-tube reservoir design separates oil from nitrogen charge. Black anodized billet end caps and components. Redundant seals, wiper seals, and scraper seals give this excellent longevity and durability. King 2.0- Aluminum 2.0 body construction with blue anodized billet aluminum end caps and components. Hard chromed HD 3/4" diameter shafts for extra strength. Special urethane seals for long life and durability. High tolerance precision components for long lift and consistent performance. These are custom valved for our application. These are also rebuild-able and serviceable! 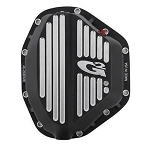 PLEASE NOTE THAT THERE MAY BE MODIFICATIONS NEEDED TO ATTACH THE CENTER MOUNT TO THE DIFFERENTIAL COVER IF YOU ARE RUNNING AN AFTERMARKET COVER. WE HAVE DESIGNED THE BRACKET TO HAVE AS MUCH CLEARANCE AT THIS LOCATION TO REDUCE THE AMOUNT OF MODIFICATION NEEDED TO MAG HYTEC AND OTHER SIMILAR COVERS. HOWEVER SOME GRINDING/MILLING WILL PROBABLY BE NEEDED. A friend of mine recommended PMF steering stabilizer for my 97 F350 to tighten up the steering a bit. The bracket design is excellent and definitely improved the steering of my truck. I did have a couple issues during the installation with the center bracket. First issue was the 4 bolts provided for the bracket wrapped around the axle were too short. Resolved by purchasing longer bolts at Lowe's. Second issue is the center bracket didn't seem to clear the tierod completely. A quick email to PMF on a Saturday was responded to the same day with a quick-fix to add a washer to shim the top bolt on the differential case; problem solved. Overall very satisfied with this product and PMF's customer service was outstanding. I'd highly recommend this kit for anyone looking to tighten up their steering. Thanks. I bought this and was not disappointed I went with the Fox 2.0 option and my steering is a 100 times better! Have 35 toyo mts. Not to mention the brackets are made to last real heavy gauge stuff. Also if you have just a little mechanical ability it takes no time to put on. Will for sure be buying more items for my trucks from here nothing else compares.